This sweet and spicy vegetarian appetizer is a real crowd pleaser. Bang Bang Cauliflower Bites are a unique, meat-free version of the popular Bang Bang Shrimp at Bonefish Grill. To keep them on the healthy side these bites are baked, not fried. This is an easy football food recipe as well as perfect for holiday parties. 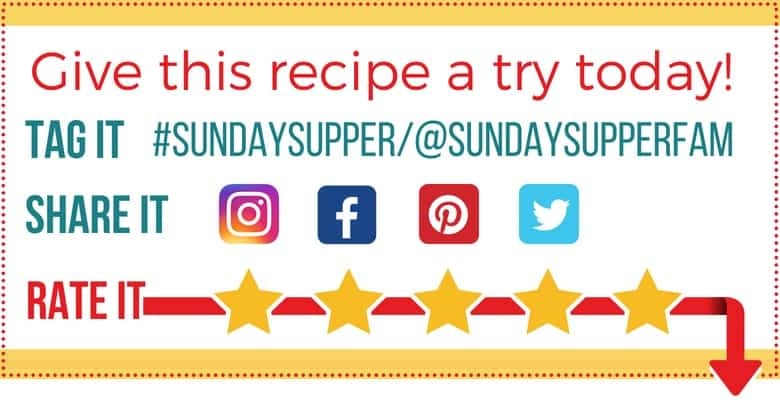 You’ll want to add this recipe to all of your party menus! 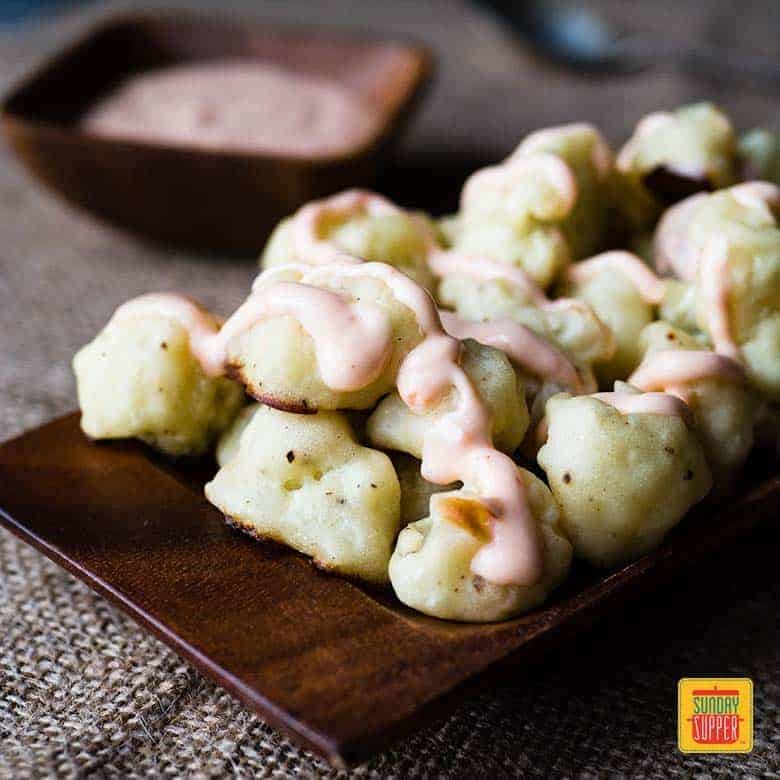 Bang Bang Cauliflower Bites – a great meat free appetizer! Cauliflower can also replace mashed potatoes, be made into tortillas, pizza crust, ‘tater tots and even steaks. It’s mild flavor makes it adaptable to a wide range of dishes. 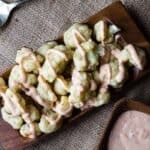 You can find cauliflower dressed up in popular sauces creating meatless versions of General Tso’s “chicken”, Buffalo “wings” and these Bang Bang Cauliflower Bites. Don’t you wish humans were that flexible? Bang bang cauliflower is dipped in a savory batter. Then baked until it’s texture softens. To keep this appetizer low carb, make sure you use a low carb flour in the batter. They taste best slightly warmer than room temperature. Another great thing about this recipe is how quick it is to make. I cut my florets pretty small so I had these Bang Bang Cauliflower Bites on the table in about 15 minutes. 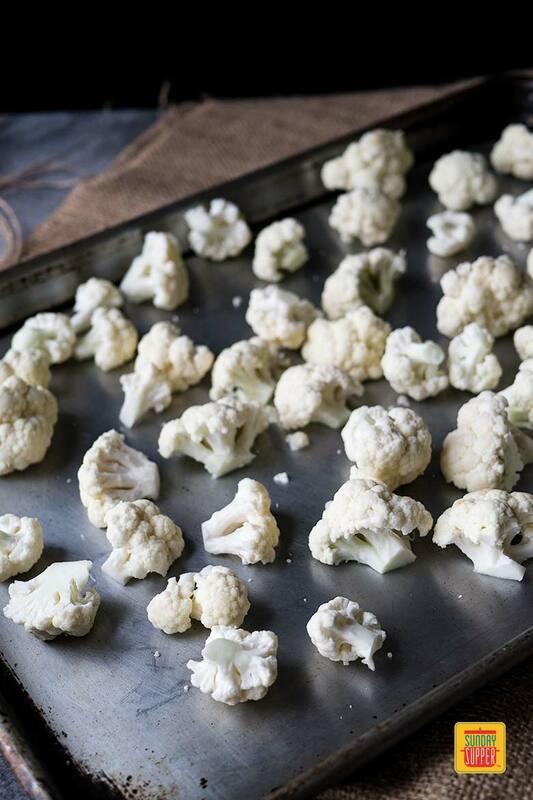 If your child likes cauliflower, this would be a great after school snack idea. Just adjust the hot sauce to suit their palate. And speaking of that delectable sauce. The sweetness of the chili sauce is the perfect foil for the heat of the sriracha and tang of greek yogurt. The only question is to drizzle? Or to dip? Here’s photographic evidence of my personal preference. A drizzle isn’t quite enough for me. But there’s no wrong answer. Just enjoy. Preheat your oven to 450 F and spray a baking sheet with oil or cooking spray. Bake for 20 minutes, or until slightly softer than you want them. Remove from the oven and gently flip the cauliflower. Return to the oven for another 5 - 10 minutes, or until golden brown and tender. 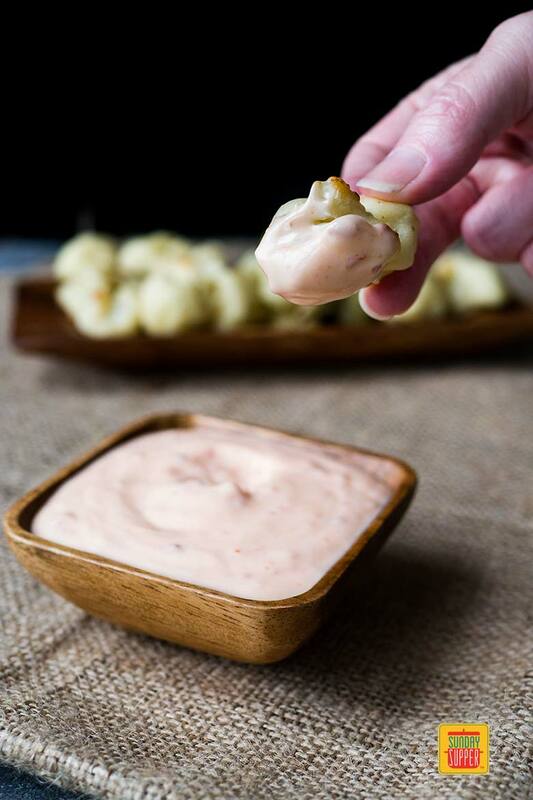 Transfer the cauliflower to a bowl, pour over the Bang Bang Sauce (you can reserve some for dipping, if desired) and gently toss to coat. Ooooh these do look good! And that bang bang sauce looks delicious!!! Thank you! It is really awesome! Mmmm….yes, these need to happen at our house VERY soon!! So awesome that these were baked not fried. A great snack to be sure! I really liked that aspect of the recipe, too. I was dying to know what was in bang bang sauce and I’m psyched I have everything to make this. This is a fun appetizer for football days ahead! cauliflower is definitely versatile! who’d have thought it could be subbed in for shrimp.